It's the middle of summer weather but there are some days when the nights are cold. On one of those nights, I had this intense craving for misua soup but I didn't know where to get myself a bowl of one. So I decided to make my own version. My meat-free misua soup with tofu+potato croquettes. Misua is one of those types of food that remind me of my childhood. My grandmother used to cook misua with patola and although I wasn't a fan of the patola, I still savored slurping the thin noodles with the flavorful soup. My version doesn't have any meat on it and I made the soup quite thick so I didn't even need rice to eat this with. Am sure most of us know how to cook misua. 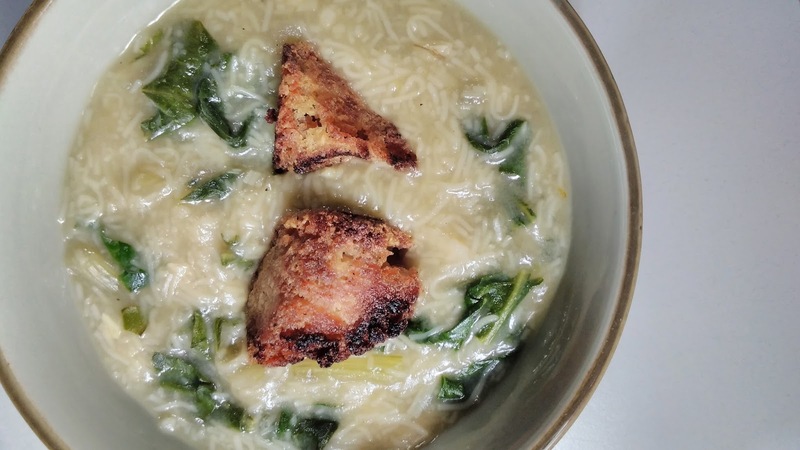 This post is about the meat alternative that I used to go together with my soup. I am not very good with measuring things, hence I only indulge in baking mostly when the craving hits me. I do most of my experiment with food on the stove top and with a pan. So this is more of a food experiment and not strictly a recipe. I will provide the outline of the recipe so to speak and you can fill-in the rest with your own taste preferences. For my misua's "meat balls", I decided to make my own with just potato croquettes but I thought I didn't want to eat just another carbohydrate so I decided to add the tofu to make it heartier. I boiled 6 medium-sized potatoes and half a carrot for both my croquettes and my potato salad. I already put salt in the water. Once cooked, I drained them and returned them to the same pan I boiled them in. I turned the heat on low and mashed the potatoes and carrots in the pan. This is to get rid of excess moisture which would make the salad or croquette soggy. At this point, I added a bit more salt and some pepper to incorporate them into the potatoes and carrots as I mashed. I used half the mashed potatoes with most of the carrots for my potato salad so it's about 3 medium-sized potatoes for the croquettes. Set aside for a bit. In a separate bowl, I mashed the tofu. I used the whole block of firm tofu which I bought from the grocery. I have used tofu bought from our local taho vendor as well and it works just fine. Before mashing, I had squeezed the tofu a bit to get rid of excess water and patted it dry with paper towels too. Once tofu is mashed, combine it with the mashed potatoes. At this point, you can put in any flavorings that you like using powdered spices. The powders I used were: garlic, onion, pepper, cumin and turmeric. I used maybe 1/8 tsp of each but you can add more to your liking. I also added some liquid smoke (but this is optional) and some soy sauce. Mix everything to combine. You can also add in other veggies that you like to make the balls even more heartier and filling. Some veggies you can add are bell peppers, onions, carrots, green peas, cauliflower, broccoli, mushrooms and even cabbage leaves as well as chives, spinach, parsley and basil. Just make sure to chop them finely so they cook easily when fried. If you find that the whole mixture is too soggy, you can add some flour, about 2 tsp - 2 tbsp. When everything is combined, scoop some of the mixture and form into balls, or patties or logs. You can do this until you finish off all the mixture, then coat the balls with flour or panko breadcrumbs like I did. After this, I recommend putting them in the fridge for at least 30 minutes to allow them to set for easier frying. If you arranged them on a tray, cover them with clingfilm before putting in the fridge. I put mine in a container with a lid. I don't really like deep frying so I just pan-fried them and flipped them over to brown on all sides. I made about 20 golf-sized balls with this batch. I used half for my dishes and froze half. The texture of these when fried will be crispy outside but very soft on the inside. Having those extra veggies would add to the firmer texture so they don't fall apart easily. Drain off excess oil and let them cool before putting in containers to keep in the fridge or freeze them for future use. You can also use them immediately to add to your other recipes such as pasta or in my case, misua soup. Or use them for your sweet and sour meatballs. I also pack them in my bento for lunch on their own and add in a sauce of my choice like plain ketchup, sesame peanut butter dip, mustard mayo or even tamarind sauce! This is a great way to put in veggies so your picky kids can get their veggies. They are a great alternative to chicken nuggets or meatballs. Make them any shape you want and flavor them as your taste buds suit you. Pair them with your favorite dipping sauce and you're good to go. Although this isn't a real recipe as far as the format goes, I hope this provides you with more ideas for a good and cheaper but still filling and flavorful meat substitute. I have not tried baking it but I hope to do so next time. If you have tried it fried or baked, tell me how your results are. What flavors would you use for your tofu+potato croquettes?